We explored digital printing and new software programs for this project. After experimenting with Tinkercad, SketchUp, Autodesk 123D Catch, and MeshMixer, I dug my heels in and learned OpenSCAD, an open source program for creating 3D CAD objects. 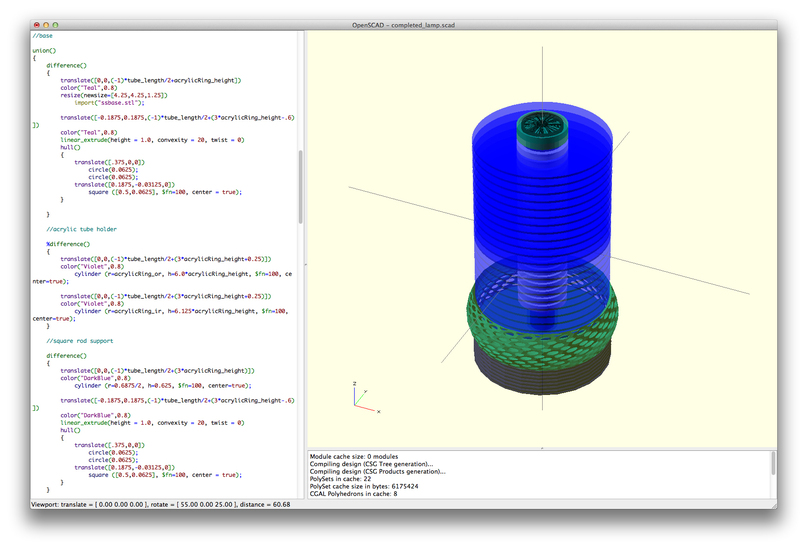 I included a screen shot of an OpenSCAD coding window. The two-part lamp base was designed in Project ShapeShifter and then imported into OpenSCAD for integration into the final project. Project Shapeshifter is a free technology preview from Autodesk Labs created to help designers model complex 3D printable geometries. I printed the solid base with an Ultimaker 3D printer. 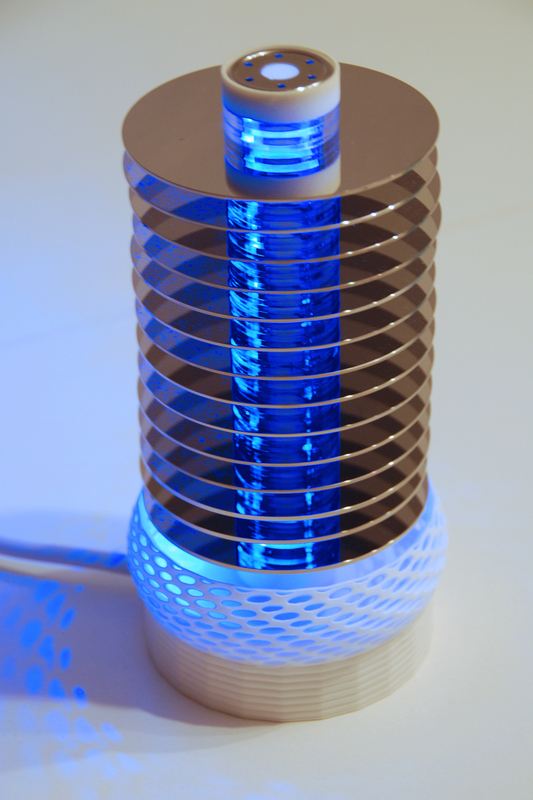 The upper portion of the lamp base was printed by the 3D printing service, Shapeways. The 3D printer software was a challenge. Designs were adjusted online and then sliced into layers that the printer could extrude. 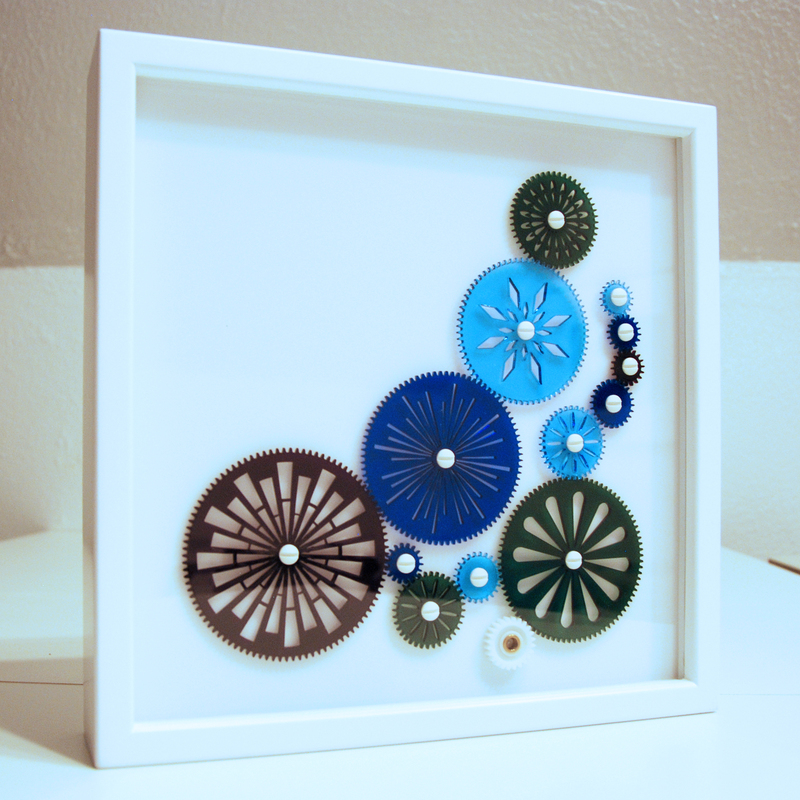 It was exciting to see my design as part of a working lamp and fun to repurpose discarded hard drive platters. A remote control allows color, brightness, and light show changes from about 25 meters. 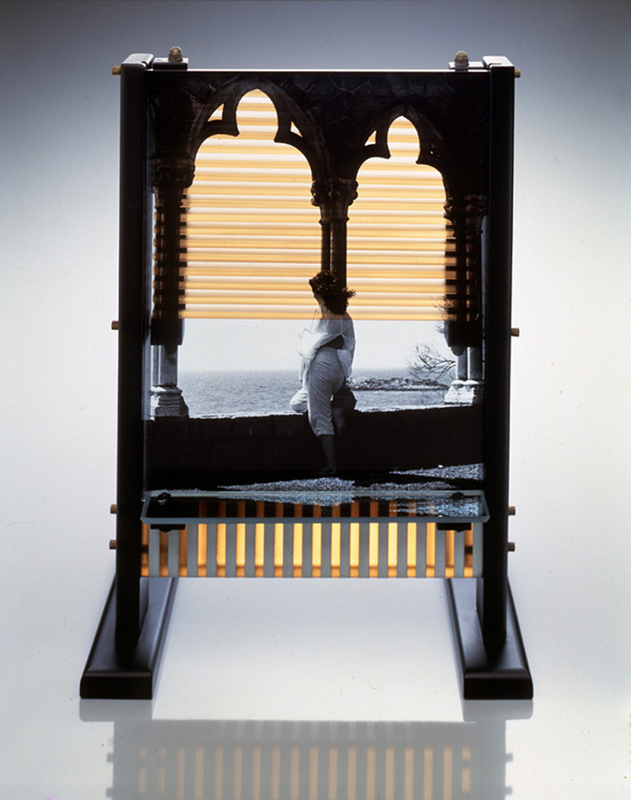 Mary Van Cline‘s 1983 The Enigma of Time inspired this photo frame. 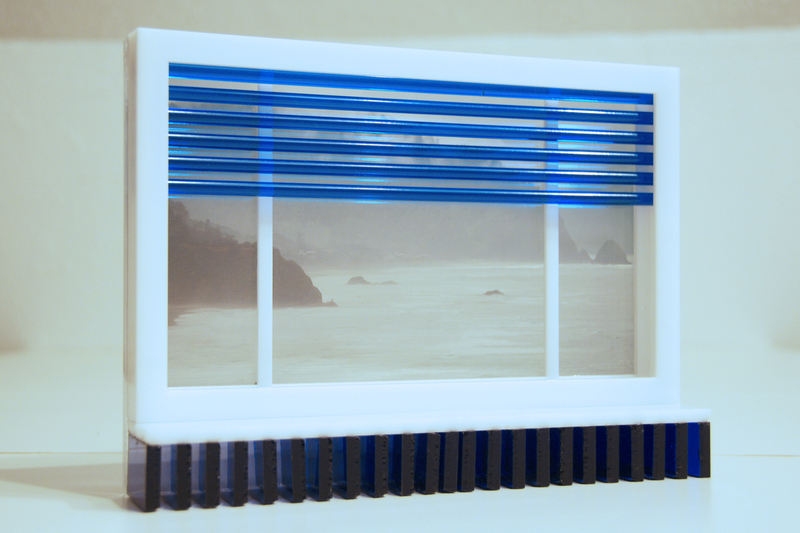 Van Cline used photosensitive glass and glass rods where I incorporated a laser-printed transparency and acrylic rods. Capturing the venetian blinds effect with background light affecting the transparent image was my intent. Geometric design includes the Golden Ratio (Da Vinci’s divine proportion). The photo inside the simulated window was taken in Oregon—just south of Seaside. 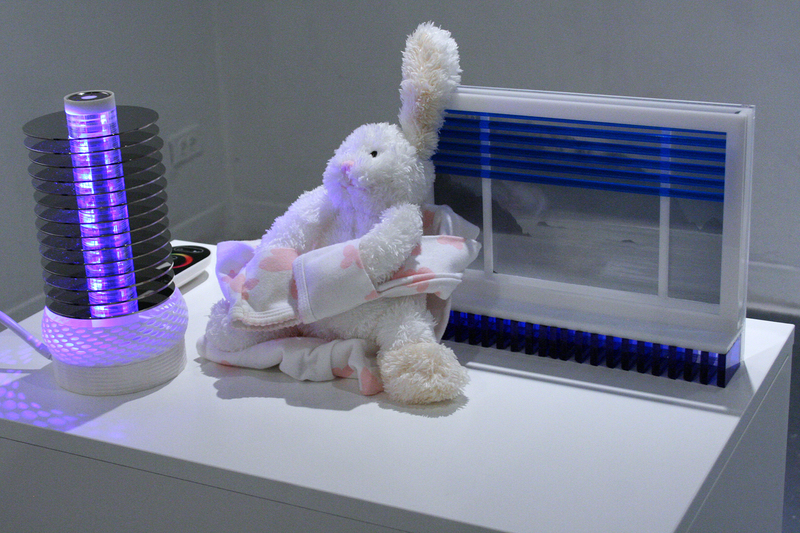 During critique, I placed the frame, a lamp made from hard drive platters, a stuffed rabbit, and a onesie that my granddaughter outgrew on top of an Ikea computer cabinet. I was excited to discover the extrude feature of Adobe Illustrator when creating the project sketch. The critique photo on the right was taken by our Digital Fabrication instructor, Brian Evans. Laser cutting was the emphasis of this Digital Fabrication project. 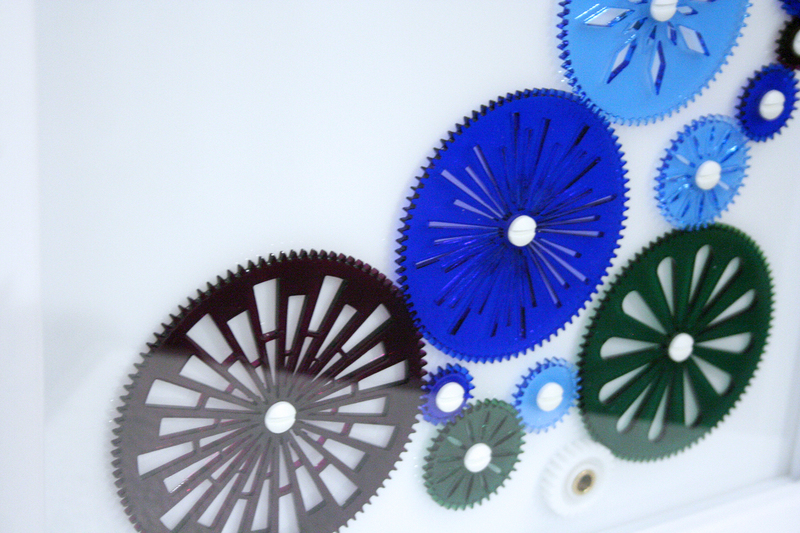 Building a set of 24-pitch gears in Adobe Illustrator was a time-consuming challenge. I designed a back frame cover to reveal the inner workings of the motor, right angle gear box, and power connection. 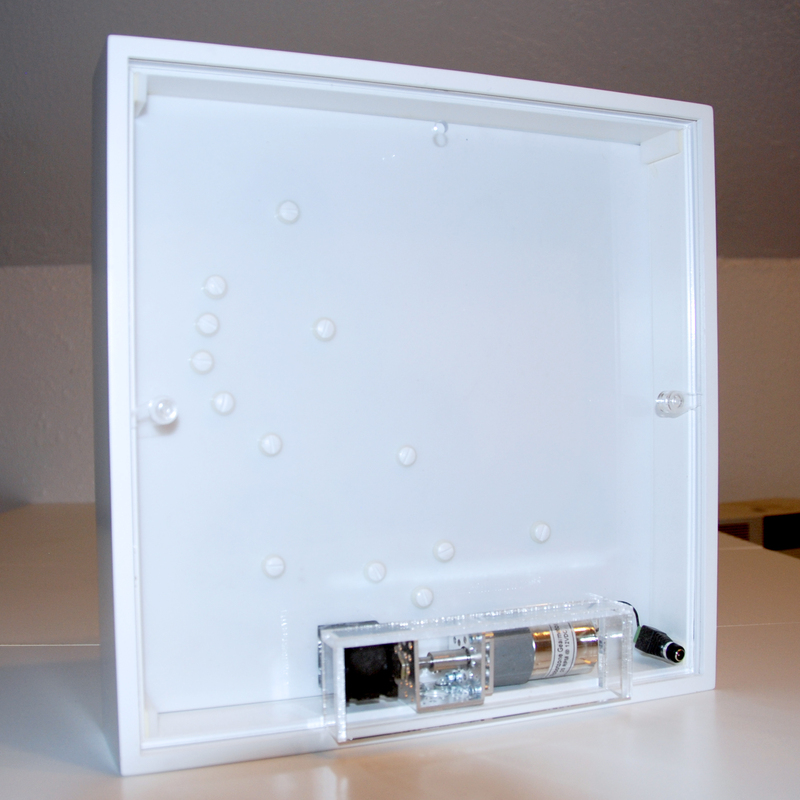 The 1/16″ laser-cut latches fit perfectly to secure the project in the shadow box frame. I’ve made several trips to Plasticare this semester! The close-up image was captured during class critique by our Digital Fabrication instructor, Brian Evans.